Our toilets and sinks are down the hall from our main classroom. 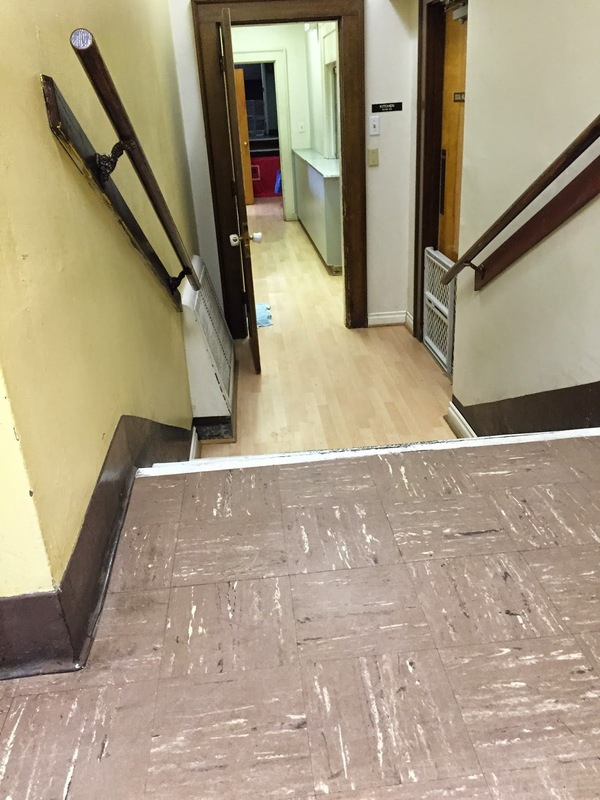 The older kids come and go as they see fit, but for safety reasons, we limit access to this hallway for our youngest students, usually by closing doors. Many of them are still in diapers, those who aren't either want or need adult assistance, and some still struggle with operating the sinks, so we would need to be escorting children in any event. Part way into our morning, parents take over for about a half hour as I slip out to prepare for the outdoor portion of our day. As a signal to let the parent-teachers know that I'm ready, I open all those doors (there are, in fact, five of them between the classroom and outdoors) and wait sitting on a bench in the hallway. The spot I wait was chosen so I will spot any kids who might make an unauthorized break for it, and be in position to steer them back to where they belong. At some point, adults then bring children to the sinks to wash-up before their snack is served. They come up this hallway, spy me at the end, and head toward me. As they approach, I say, "I smell some stinky hands coming my way." They then, one by one, of their own volition, come hold their hands under my nose. I sniff, then say something like, "Those hands are stinky!" or "Oh gross, your hands smell like play dough!" then say, trying to sound a bit like the Queen of Hearts from Alice in Wonderland ordering beheadings, "Wash your hands!" It's a silly little ritual that has sprung up this year, one that has become a collaboration between the children and me. Many will not move on until I've told them the exact "flavor" of their stinky hands, one boy requires that I acknowledge everything he touched that morning, filling me in when I don't know. Even the adults sometimes hold out their hands for me to smell. Then, when their hands are clean, they pass me again, holding their hands up to my nose once more. This time I always say, "Clean and fresh," usually followed by an echo from our previous encounter, "Go eat your food!" but sometimes I mix it up, saying silly things like, "Go eat your hair!" or "Go eat your pants!" The children then correct me, "No, go eat your food!" Those who are less verbal might stand there shaking their heads until I finally say "food." It takes some several seconds to realize what I've said, stopping in realization halfway down the stairs to turn and set me right. This is all part of my curriculum to teach the children in my care to question authority, to really listen to the words I say, and if they don't match up to what they already know to be true, to call me on it. By this time in the school year it's all become a joke, but only a few months ago, they were earnestly correcting me, challenging me, lowering their eyebrows to tell me, "No, Teacher Tom, I don't eat pants." I sometimes hear adults complain about children sassing them or talking back. I don't get much of that at all as a teacher. In fact, I can't recall it ever happening. Of course, everyday, several times a day, children will tell me I'm wrong, but it doesn't bother me because that's what I want them to do. It's what all citizens should do when things don't seem right. If I can't defend it, if I can't explain it, if I I can't demonstrate it, then, as a figure of authority, I don't have any business saying it, and I deserve to be told, "No, Teacher Tom." "You Want Mommy To Come Back"
"We'll Just Fill It Back Up"